A hunter pace is a low-key competitive event derived from foxhunting. Teams of two or three riders follow an outdoor course laid out over terrain which is meant to simulate the riding conditions encountered during a foxhunt - that is, a mixture of gaits that a foxhunter typically uses as a fox's scent is found and followed by hounds through open country and along wooded trails. There is no set length for a hunter pace course, although courses in the Western North Carolina Hunter Pace series held from November through March are typically around eight miles and can take up to two hours to complete. It is up to each team to guess what the organizers of the pace have decided is an ideal time to complete the course and to adjust its progress accordingly. The ideal time is determined by sending out one or more test teams to ride the course before the event. On the day of the event, the team which completes the course in a time closest to the ideal is placed first. Most hunter paces are divided into two divisions, with different ideal times. 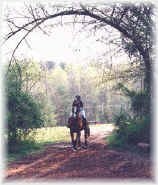 The WNC series, in which FENCE participates, offers a "field hunter" division for those experienced in the hunt field who wish to take the course at a faster pace, and a "trail rider" division for those who wish to travel more slowly. Although jumps are found along the course, taking them is always optional for both divisions. Even though there is a competitive aspect to a hunter pace, most riders simply regard it as an enjoyable way to spend a day in the countryside with their mounts and congenial company. The placings are almost secondary. FENCE hosts two hunter paces each year, one in March and one in November, both part of the WNC series. Final series standings are announced at the end of each season. Non-riding volunteers are always needed to help with registrations, with timings at the start and finish points, and at a riders' rest stop about halfway through the course. If you'd like to volunteer at our next hunter pace, email us and we'll add your name to our contact list. For the dates of this year's hunter paces at FENCE, click here.